**Image of painting was updated and re-posted within the body of this post. An extremely talented member – photographer, David Smith, of an online artist community that I belong to has recently passed. So for this months challenge, as a tribute to honor his memory, they are having painters base a painting from one of his photographs. 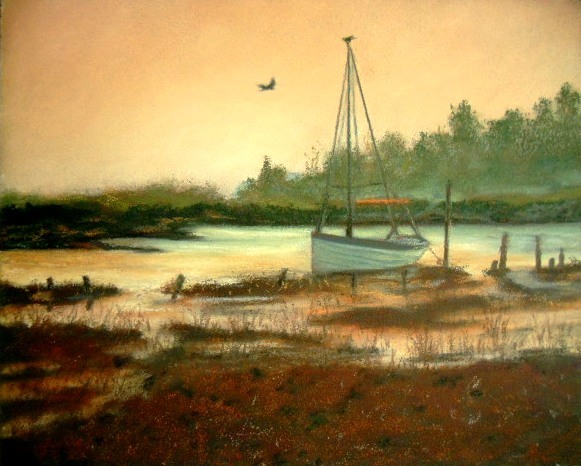 This entry was posted in About Oil Pastels, OPs New Paintings and tagged Oil Pastel, sail boat. Bookmark the permalink. Hi Laurie, thanks so much for your wonderful comment – would love for Tarzan to see it! The passing of somebody we know is always tinged with sadness and is a time of for reflection – your painting is a fitting tribute. Lovely lighting in this! Good luck!! Hi Cyndi, thank you so much for your wonderful comment. Don’t you love sunsets – very calming to watch the wonderful colors lay like satin across the Land and Sea! I can feel the silence and rest it is giving me. Hi Dawn, thank you very much for your wonderful feedback!! Hi Mamie, so nice to hear from you! Thank you for your very kind comments on the painting, glad you enjoyed it. This is great, Mary!! I love the warm light and the calm mood in this painting! Hi Calee, thanks so much for your wonderful comments!!! You described exactly how I felt when I first saw the photographers photo – it captured such a beautiful scene. A very expressive, beautiful piece Mary. It certainly contains that golden end of day feel. A heart felt tribute. This is so beautiful Mary! Hi Violet, thank you so much! When I first saw the scene, that’s what I thought – wow, such a quiet and relaxed atmosphere. Glad you liked it! Hi Patricia, thank you so much for your feedback – I really appreciate it! So nice having you back! Oh this is so lovely. I love the soft evening colors and the boat resting after a wonderful day on the water. Thank you so much Emily, it was an honor painting this scene – in honor of a great photographer. I can see why he loved this place. My only problem is I’m not able to get a good shot with my camera – it’s showing up with more light centered in the sky than what’s really there in the painting. 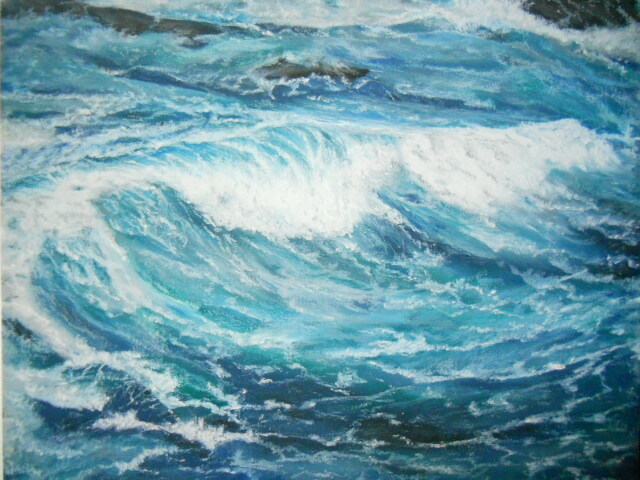 I’m going to try taking another photograph tomorrow and if better will post it in the “Seascape” gallery.